Yoshioka Tatsuya during a press conference at Seatrade Global. 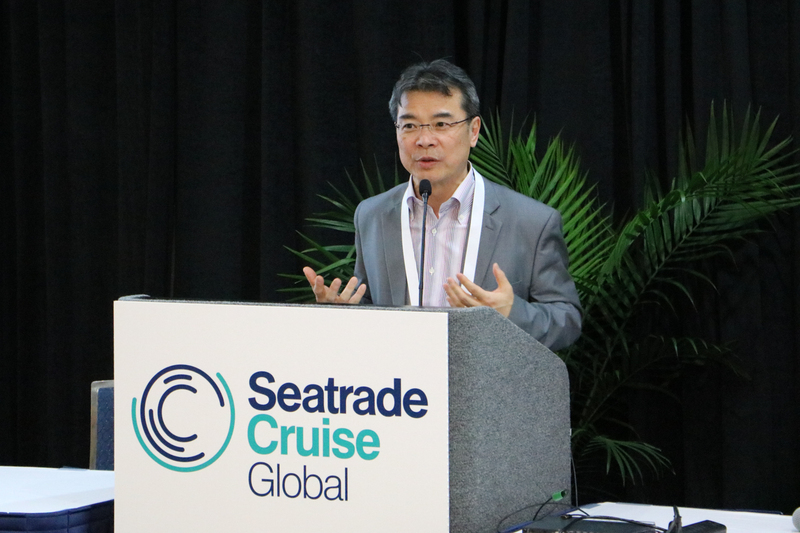 Peace Boat Director and Founder, Yoshioka Tatsuya, will be one of the industry leaders to speak during Seatrade Cruise Global, the leading annual global business-to-business event in the cruise industry. The gathering will take place in Fort Lauderdale, US, from March 5-8. Yoshioka will take part in the conference ‘Environmental and Sustainability Outlook’ on March 7 at 11 am (Rooms 222/223) at the Broward County Convention Center. As the cruise line industry continues to drive responsible, sustainable cruising, this panel will discuss the latest developments and initiatives including future regulations, waste management programs, energy efficiency innovations and the future of LNG ships. The rest of the panelists will be Carl Berglund (Head of Sales, Climeon), Bud Darr (Executive Vice President, Maritime Policy and Government Affairs, MSC Group) and Ukko Metsola (Vice President, Government Relations Europe & Asia-Pacific, Royal Caribbean Cruises Ltd.). Over 25 panels are scheduled over four days delivering a wide-ranging program. Bringing together buyers and suppliers for a four-day conference and three-day exhibition, Seatrade Global draws more than 11,000 registered attendees, over 700 exhibiting companies from 113 countries and more than 300 international journalists to become the cruise industry’s epicenter of ideas, products, and services. This is the third consecutive year that Peace Boat and Ecoship will be presented.